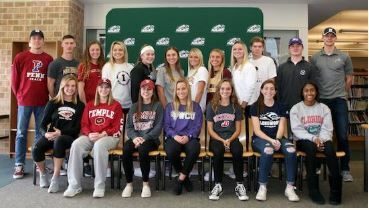 As the winter sports season comes to a close and the spring season starts, two-thirds of the way through the school year, many have come to the realization that this year has been a stellar year for Pennridge athletics. Through the success of multiple programs such as, men and womens soccer, wrestling, men and womens basketball and the men’s track team, it is proven that the athleticism shown by these groups this year will be one for the books. This year men’s soccer has gone the farthest in the playoffs since 2009 after years of slim to no playoff appearance at all. The rams went 13-5-2 with 54 goals for and only goals allowed. With senior leaders and standout players like Matt Stevenson, and Aidan Link the team was determined all season to make a strong run “For the boys” and that they did. The women’s soccer team made it to the state championship in Hershey this year. The girls team has consistently been successful year after year, but this year was different. They won their division by far going 24-4-1. They blasted through the PIAA state tournament all the way to the championship. They ended up playing Souderton who placed 4th behind CB West and North Penn. Pennridge led by senior college commits Abby and Molly Groff, Ashley Groeber, Mary Kate Levush, Nicolette Harrison, and Sarah Williams, went on to lose against Souderton in a close game, that ended 1-0 in overtime. The hockey team won their league against CB South going 11-2-1. Led by goalie Luke Stranick, Mike Walker and Eric Slater. They were one game away from playing at the Flyers Stadium where they came to a loss in the flyers cup state tournament. All of varsity hockey players shared one common thing which Senior Eric Slater stated as, “The thing we enjoy the most about hockey is always having fun with the boys.” When your a strong team with lots of talent the game becomes second nature is how it seemed to be from the hockey team. Men’s Basketball, whose starting 5 is division 1 Navy commit and said to be “school legend” Sean Yoder, Jon Post, John Dominic, Jack Gillespie, and Trent Fisher led the team to great success this year. The strong senior 6 consisting of not Trent Fisher but Nick Dunn and Pat Gillespie instead is a group that will be missed by coaching staff and underclassmen. Sean Yoder, the teams headliner, has led this team to success by rallying them just like he was as a freshman. Sean stated that, “My freshman year my brother Kyle and Dan Long took me under their wings and helped me become the player I am today. They played in the 6A state championship in Hershey, Pennsylvania against a team ranked 17th in the nation. Kennedy Catholic is made up of D1 college recruits, but the rams were relentless in this one where they lost 64-62 in double overtime. A game remarked as “the best game we’ve ever seen”, by the PIAA announcer at the conclusion of the game at the Giant Center. The track and field team has won the last 4 years with multiple undefeated seasons. This year they hope to do the same. The 4×4 relay team who placed first in the state and seventh in the nation. Senior runner, Luke Eissler says, “Andersen will most likely be the favorite for the spring season.” It is only a mystery what they will do this year with records, victories, and invitational meets. From a foundation of strong veteran senior athletes, it seems to bring success to teams around the school. We have 20+ college commits this year to division 1, 2, and 3 athletics. Senior student Emily Hegen says, “This year’s senior class is honestly one of the best with sports.” She also is excited to see what the rest of the year brings us with 2 visits to Hershey already. Hopefully the underclassmen can fill those shoes for years to come. With hard work and dedication, as always, our school can continue to experience the success we have been brought this year.